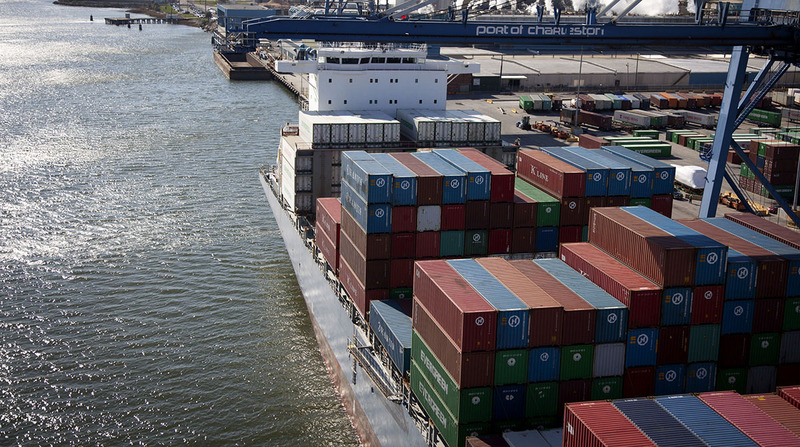 South Carolina Ports Authority reported a 1.8% gain in container volume growth in the first half of its fiscal 2018 year and announced the arrival of two new cranes just as it begins to deepen Charleston Harbor. SCPA handled 1.2 million 20-foot equivalent container units, or TEUs, from the beginning of its fiscal year in July 2017 through January. The port handled 167,398 TEUs in January. “Strength in global container trade continues to drive increases in the port’s container volumes, and at the current pace SPCA is on track to achieve a combined 12% growth rate over two fiscal years,” CEO Jim Newsome said. SCPA also moved forward on its $48.4 million project to build the Wando Welch Terminal’s capabilities for handling larger Neopanamex vessels by adding two new ship-to-shore cranes that can lift containers 155 feet above the docks. It plans to commission the cranes in June. The new cranes will join two Neopanamex-capable cranes at the terminal and plans call for adding another in August 2019. The port also is raising four existing cranes from 115 feet to 155 feet. The goal is to have 13 cranes available by the fall of 2019 with nine capable of handling Neopanamex-size vessels. The harbor deepening project is scheduled to be completed in 2020. It calls for channels with a depth of 52 feet in the inner harbor and 54 feet in the entrance channel. SCPA owns and operates public seaport facilities in Charleston, Dillon, Georgetown and Greer.